Introduction to Program, ‘In 1974, the Planning Committee of the Muslim Students’ ssociation of the U. S. and Canada sparked the idea of designing a comprehensive curriculum for American Muslims who have recently embraced Islam. Such curriculum is greatly needed by a large population of Muslims in North America to help them understand Islam as a complete way of life, practice it and live up to its ideals. To satisfy this need, the task of producing the curriculum and its supportive material was entrusted to the Department of Education, Publication and Information. 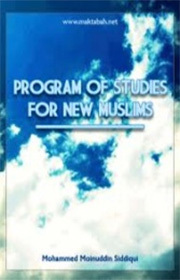 Through the efforts of that Department and the Islamic Teaching Center, Dr. Mohammad Moinuddin Siddiqui undertook to work out” A Program of Studies for New Muslims.” His deep commitment to Islam and conviction of the significance of education as a crucial vehicle for social change prompted him to devote his time and finish the first stage of this tremendous and challenging work. The second stage is the writing of text books which are specifically tailored to the sequential level series of thisprogram of studies.